for his pioneering work in blood preservation. 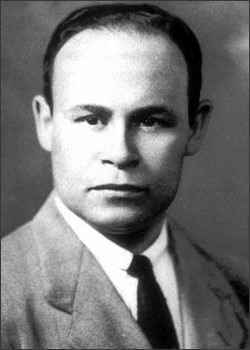 Charles Richard Drew was born in 1904 in Washington, D.C., the eldest of five children. When he was in school he loved sports and was a tough competitor. He could have become a professional athlete or coach, but he dreamed of becoming a doctor. In 1928 he entered McGill University Medical School, in Montreal, Canada, and won membership in its Medical Honorary Society. It was at McGill that he became interested in blood research. Charles graduated from McGill University in 1933 and was awarded the degree of Doctor of Medicine and Master of Surgery. He served as an intern for a year at Royal Victoria Hospital and Montreal General Hospital. Then in 1934, he became a resident in medicine at Montreal General Hospital, where he researched blood chemistry with his former professor John Beattie. After internships at the Royal Victoria Hospital and the Montreal General Hospital, in Canada, he taught at Howard University's Medical School. When he was at Columbia Presbyterian Hospital, in New York, he devoted his research to studying blood transfusions and the storing of blood. He discovered that plasma, which is the liquid portion of blood that does not contain cells, could be dried and stored for an extended period of time without deteriorating. This great discovery was noted worldwide. In 1939, he received a grant from the Blood Transfusion Association and opened a blood storage bank at the hospital. He became the first African American to earn a Doctor of Science in Medicine degree in 1940. At the beginning of World War II, Dr. Drew's former instructor, John Beattie, was Director of Research Laboratories at the Royal College of Surgeons in London. He was in charge of blood transfusions for the Royal Air Force and asked Dr. Drew to assist him in providing blood. Dr. Drew took thousands of pints of dried plasma to England and was named medical supervisor of blood for Great Britain. He organized a system of volunteer blood donors and centralized the collection of donated blood where he processed the blood and separated out the plasma. The project was later taken over by the American Red Cross and Drew became director of the blood bank in New York. He also became assistant director of blood procurement for the National Research Council for the U.S. Army and Navy. During the war, the Army, Navy, and Red Cross had separate blood banks for blacks and whites. Because the blood had to be collected and stored separately, it was costly and time consuming. Commenting on this situation, Drew said, "There is no scientific basis for the separation of the bloods of different races except on the basis of the individual blood types or groups." Dr. Drew then resigned his position in protest and returned to Howard University to teach surgery. Dr Drew was killed in an automobile accident while on a trip to a medical meeting at Tuskegee Institute in 1950. There is a myth that he died because he was taken to a white hospital that refused him a blood transfusion, but the truth is that the doctors did everything they could to save him. At his untimely death, Dr. Drew left behind a devoted wife, four children, and a legacy of inspirational, unstinting dedication to service for all people. In 1981, the U.S. Postal Service paid tribute to Dr. Drew by issuing a stamp in his honor. 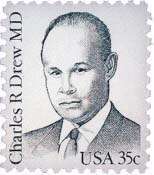 Every blood bank in the world is a living memorial to the genius of Dr. Charles Richard Drew.